What can we learn from climbing trees? Tree climbing is out of favour, with children more likely to hurt themselves falling out of bed than off their arboreal perch. So if they fail to branch out, are they missing out? Professional tree-climber Paul McCathie can dangle happily at 60 feet up, in the canopy of a mature oak. He has ascended to his lookout spot with help from some non-traditional ropes and a harness. Above the ground and among the leaves, there” s a view, a feeling of light, calm detachment from everyday worries and the physical buzz from the conquering effort to get there. His extreme sport is a take on a pastime that is fast dropping out of favour with children, however. Figures from accident and emergency departments in England show that injuries from tree falls are down amongst the under-15s. In 1999-2000, 1,823 cases went to casualty. By 2006-7, that number was down to 1,067, according to hospital statistics. Children are more likely to injure themselves in a tumble out of bed “ 2,531, up from 2,226 in the same period. This trend is not thought to be because their climbing skill is increasing, rather because they are climbing trees less often. Adults who take part in climbing workshops such as Paul” s reminisce about the hours spent in tree branches during a Blyton-like childhood of dawn-to-dusk free play or cheeky scrumping antics. For young people, it can often be a first-time experience, and they tend to be more reticent, more risk-averse. 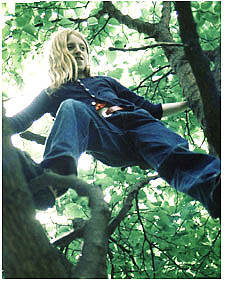 Climbing trees is often discouraged or ruled out at nurseries and schools. Instead, children are directed to soft-surface, official play areas in parks or at home, where injury figures are slightly up. Broken wrists, fractured femurs or any injury to a child is nothing to celebrate, but does it matter if they choose not to climb trees? The Royal Society for the Prevention of Accidents, the charity charged with promoting safety, says it has “nothing against” it. Like “getting muddy, wet and stung by nettles” it is part of childhood and can stand you in good stead. Psychologists say youngsters more partial to computer games than being in the open air may bypass the physical and mental well-being boost from playing outside, immersed in nature. Climbing trees teaches life skills and how to deal with the unexpected, they believe, which are lessons best learnt within the family or amongst friends. Child psychologist Ruth Coppard says: “You learn to take risk, assess risk and manage failure. That it” s much harder to come down than go up, or what to do if your mate falls on the floor.” Those abilities translate to later life, at work, or out and about. Falling out is just a “vague” memory, rather than a dramatic or traumatic one.